It's part of a multi-million dollar plan to improve the grid. Recently, Elon Musk won a $50 million bet when he completed the building of the world’s largest lithium-ion battery in less than 100 days for the southern Australian outback. This was a move to support the lacking, local grid to prevent future blackouts. As of December 1, this Australian mega-battery has officially been switched on. “South Australia is now leading the world in dispatchable renewable energy,” said state Premier Jay Weatherill at the official launch of the battery at the Hornsdale wind farm, Reuters reports. The 129-megawatt-hour battery has garnered significant press for both its size and the nature by which it was acquired. Some have called the battery a “Hollywood solution,” which likely stems from the flashy nature of the battery’s creation in a country that does still rely partly on fossil fuels. Yet there are still many supporters of this move, who argue that the region could seriously benefit from the battery which could stabilize the grid. This is especially important given that this state gets a whopping 40 percent of its electricity from wind energy. That’s great news for a transition to renewables, but the wind is not always blowing; over the past 18 months, the region has suffered a series of blackouts. This is where the battery comes into play. “Storage can respond within a fraction of a second. It can address those stability issues very quickly without needing to resort to using large power plants,” said Praveen Kathpal, the vice president of AES Energy, who also bid for the battery contract. The battery is part of the state’s AUS $510 million (US $385 million) plan to improve the grid. This well-funded mission includes, in addition to the battery, diesel-powered turbines — so the plan is not entirely renewable. South Australians have also invested big in rooftop solar. The state is taking serious strides to both become independent of fossil fuels and create a much more stable grid. Between household solar panels, a robust wind farm, diesel-powered turbines, and this mega-battery, the state is well on its way to achieving these goals. 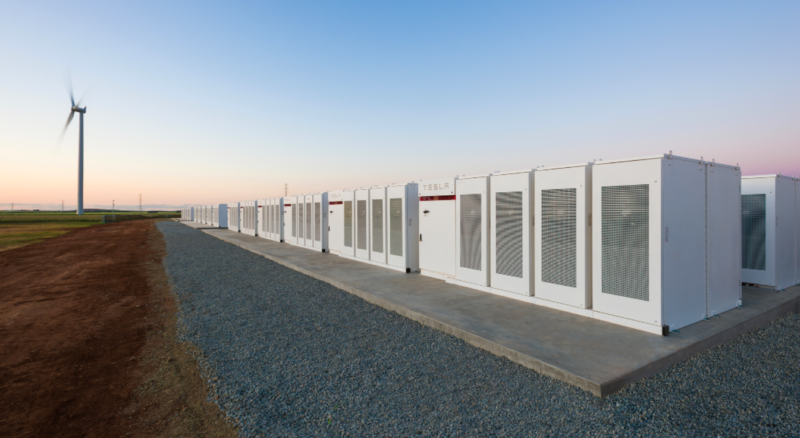 Tesla’s Australian mega-battery will undergo regulatory testing until it can be fully implemented in the energy system. But, if the speed of progress thus far is to continue, it won’t be long before this region is powered sustainably and and reliably.